Universally recognized for its devotion to open and rigorous inquiry, the University of Chicago is an urban research university that has driven new ways of thinking since 1890. The strength of our intellectual traditions, intense critical analysis, and free and lively debate draws from our engaged scholars who continually seek creative solutions to complex problems. We empower individuals to challenge conventional thinking in pursuit of original ideas. Students in the College develop critical, analytic, and writing skills in our rigorous, interdisciplinary curriculum. Through graduate programs, students test their ideas with UChicago scholars, and become the next generation of leaders in academia, industry, nonprofits, and government. Undergraduate courses across the curriculum, including quantitative methods, upper-level Economics courses and a selection of UChicago’s famed Core sequences. The Booth Summer Business Scholars Program, for undergraduate and post-baccalaureate students from any major interested in careers in business. 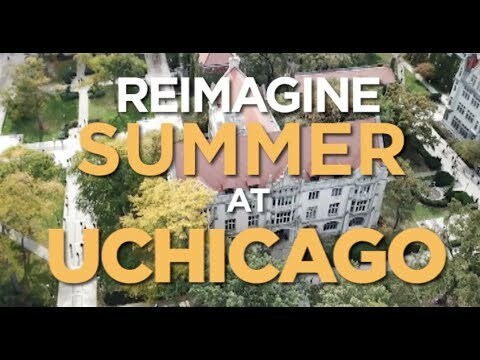 UChicago Summer Session is an ideal experience for those interested in challenging themselves, as well as those interested in pursuing graduate or professional degrees at the University of Chicago. The University of Chicago, situated in Hyde Park, offers a rich campus life in a big-city setting. Summer in Chicago brings out the best in the city, with a seemingly endless variety of food, music, and cultural events to experience and enjoy after the class day is over. Join us and learn for yourself why the University of Chicago is ranked #3 on US News and World Report’s annual listing of the best universities in the United States. This course reminded me why I love economics. In addition to the engaging and interesting topic of labor economics, [the instructor] would often take time to talk about the history of the Chicago School of Economics and regularly bring a novel perspective on any topic we as students were curious about. It felt as though this course brought together nearly all the topics I had covered in the economics major, but this time in a coherent and integrated framework. I now am more conscious of tradeoffs both in the world of economics and outside. To me, everything is now a question of what am I willing to give up to get what I want? I have already caught two specific examples of economic statistic misuse (i.e. flows to stock comparisons and intermediate good accountancy errors). I greatly enjoyed learning about the topic. I feel that no matter what I do when I graduate I will have to deal with the economy and money as I will always be a consumer. I think this class greatly contributed to my cultural literacy and an understanding of how the world works, which shifted my perspective-my favorite part about learning. I had minimal business exposure before entering this program. Mainly for myself as a classical singer, my background was focused heavily in the performing arts. This program opened up so many doors for me and, more importantly, offered me a completely new way of looking at the world. Partial tuition reduction is available to students from our partner colleges and universities. For more information on whether your school is a partner, contact us at summersession@uchicago.edu. All UChicago Summer Session students have the option of staying on campus while attending classes. Summer Session students stay in the Campus North Residential Commons, UChicago's newest and most modern facility. A full board plan is included with on-campus housing. Those wishing to stay off-campus typically sublet apartments in Hyde Park or in the Loop and immediate surrounding areas. Express busses and Metra trains run regularly from downtown Chicago to the campus of the University of Chicago. Those unfamilar with Chicago are encouraged to reach out to Summer Session staff with questions about recommended neighborhoods.